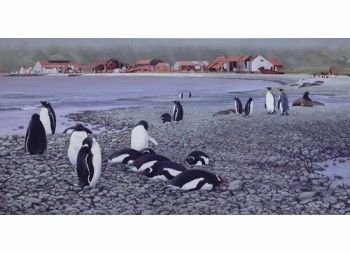 Sold exclusively for SGHT, John Gale has created this wonderful image of Stromness harbour and whaling station with the wildlife of South Georgia in the foreground, including elephant seals, king penguins and gentoo penguins. The print you receive will be signed by the artist John Gale. Image size 19.5 x 38.5cm on A2 watercolour paper.